Yet another English Premier League day with no Draws, and the percentage falls still further to 17.37%, the lowest in 114 years. Manchester City's win at Crystal Palace took Aways to within a whisker of 33.33%, with 111 wins in 334 games. 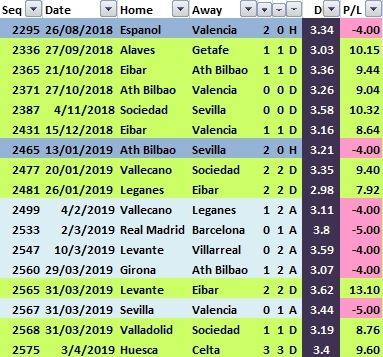 @FootyInvestor mentioned the contrasting abundance of Draws in La Liga this season and at 29.97% at the time of writing, the current strike rate is beating the 29.47% of 1999-2000. From a betting perspective, the strike rate is, of course, meaningless. The strike rate could be 50%, but that doesn't mean backing all Draws would necessarily be profitable, since it all depends on the price. Finding matches where the Draw is under-priced is the key. Using the relative difference in win probability between the two teams works well in this league, with the Draw in matches up to the 25% level generating an ROI of 8.81%. As I did last year, I am planning to take a look at some of the leagues again, but as a sneak preview, I can say that if you followed the advice above, you'll be aware that the trend continues, at least so far this season, with an overall ROI of 23%. If you weight your bets, increasing stakes to account for the narrowness in difference the difference, ROI increases to 36.85%. While level stakes are the only way to measure the strength of a system, the optimal staking method is to adjust stakes depending on the perceived edge, i.e. Kelly. One season is far too few matches to 'draw' any conclusions from, but going back to 2012-13, this method has an ROI of 23.6% to level stakes from 149 matches. Interesting to note the range of prices on these games, from a low of 2.98 to a high of 3.62. Our sceptical friends, awaiting statistical proof, won't be convinced that there are opportunities here, but for mere mortals of us living in the real world, such consistent returns are, in my opinion, worthy of interest and indicate an area of inefficiency in the market. Waiting for statistical proof is great if you are trialing a new drug, but in ever changing betting markets, it's practically useless, by which I mean it is useless in practice.